In November of 2017, I began work as a video producer with InnerAction Media. One of my first assignments was to produce a series of advertising videos for Rominger Dental in Bridgeport, WV. 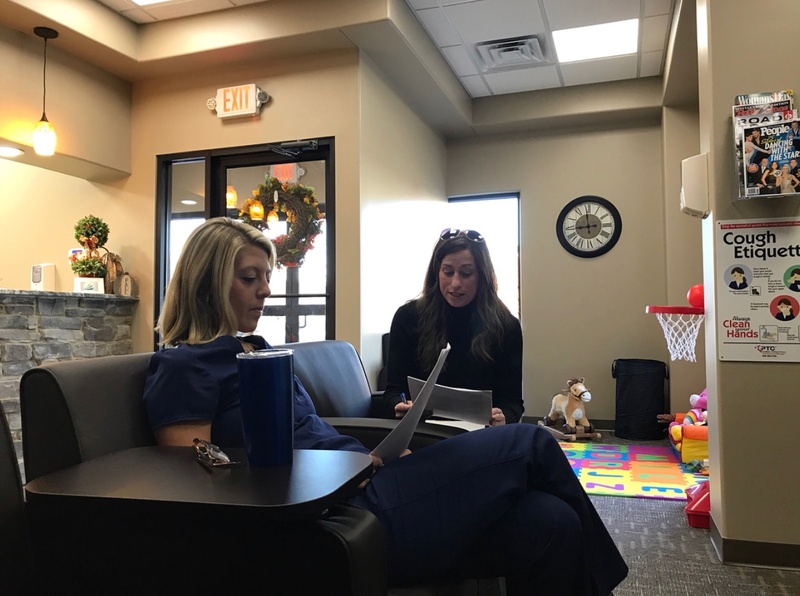 Dr. Jaclyn Rominger (Dr. J as all of her patients call her) had been practicing in the Bridgeport area for about eight years, when she decided it was time to branch out on her own and open a new dental office, Rominger Dental. Read on to learn more about how we helped Rominger Dental produce video commercials. Dr. J came to the InnerAction Media office to discuss our video services and to participate in our standard client intake meeting. During this meeting, we got to know Dr. J and all about her new practice that was opening later that month. We asked a lot of questions about her, the practice, and her patients' needs and what she hoped to achieve with InnerAction Media. The goal behind this meeting was to collect as much information from her so that we could help clarify her message and work to get that message to the right people at the right time. I was also impressed by the clear vision of the atmosphere that she wanted to create in her new office. Besides quality dentistry, her number one goal was to create a comfortable environment where everyone would feel welcome. The first video that we set out to make is what we call an Image Film. An Image Film is a video that tells the story of the business. In most cases, this type of video will include a testimonial interview (or two). Testimonial interviews can be used as stand-alone interviews or can be incorporated into a more in-depth production, such as the Image Film. A testimonial video interview can be a powerful marketing tool for dental practices and any other business or product. No matter what your business may be, testimonial videos/interviews can have a huge impact. A written testimonial is a powerful marketing tool, but a video testimonial is even more impactful and more credible. One of the best ways to improve the image of your business is to use testimonials from happy customers. With videos, especially a good one, there is no hiding how the person truly feels. Anyone can write something down, but to see the person is a whole other ballgame. Testimonial interviews can be a very powerful tool, but you’ve got to ask the right questions. Asking the right questions requires you to know your message. Knowing your message means knowing your client and really taking it a step further to hone in on your customers’ needs and desires. For Dr. J, we knew from our intake meeting that she knows people don’t like going to the dentist. She knows that people (grown-ups and children alike) often times actually fear the dentist. She made every effort to make her new dentist office a very comfortable and welcoming environment, and her patients noticed. The message that we wanted to get from our on-camera subjects was not just that they feel comfortable and like it there but why they felt comfortable there? What is it about her office that actually makes them feel good. Besides the heated massage chairs, overhead TVs and coffee bar, there were a lot of reasons why patients enjoyed going to see Dr. J. In addition to knowing the message, you want to get and ask the right questions of your on-camera subjects. You need to make them feel comfortable. These are real people, and in most cases, they haven’t spent much time in front of a producer and camera crew. Rather than just firing off questions, you need to take the time to get to know the person (preferably before sitting down for the interview). You need to make them feel relaxed and try to make them forget about the camera next to you. Making the interview more conversational will help in putting your interviewee at ease. When your on-camera subject smiles and feels/looks more relaxed your audience will sense that these are honest and true feelings, not just canned responses. When we interviewed patients of Dr. J, we came prepared with questions and ideas of the kind of answers we wanted to get, but we were also flexible and allowed them to speak freely about Dr. J. Doing this elicits the best, most genuine soundbites. Make the most of your testimonial interview and come prepared with a series of questions and topics. This will allow you to use this interview for multiple applications. So, not just one social media clip, but maybe you will have enough for three social media clips. One of Rominger Dental’s other messages was the convenience of her location, and we made sure to discuss that with some of our testimonial interviews. Who are the Best Testimonials? The best testimonials are of course actual people that are devoted customers. And, in most cases, if someone agrees to a video testimonial, they are just that. In all honesty, finding patients to talk about Dr. J of Rominger Dental was fairly simple. Her reputation as a great dentist and person was evident after talking to just a few people. When all was said and done and Dr. J’s videos were complete (1 image film, a 30 second commercial and 2 social media clips), she was very pleased with the final products. Now, I don’t want to say my first project for InnerAction Media was easy (video production is far from that), but when you have a great client, with customers that truly value her service, proving that fact becomes a much easier task. At InnerAction Media, we understand that you want to get your message out to your consumers clearly, concisely and in a manner that makes them comfortable. That's why we take every video production client through our video process. If you would like to take about your next video, click below to contact us!